Today was my most enjoyable day on trail for the entire journey! I have never witnessed beauty like I did heading up and over Cut Throat Pass. We headed to the trail fully equipped with new gear and snow shoes thanks to Hercules’ parents who drove us to Winthrop, waited for us to purchase boots, gaiters and new gloves, then drove us back up to Rainy Pass. We are eternally grateful and couldn’t have done it without them! As we were resorting our gear at the pass a car pulled up with another thru hiker called Green Tea, who we had met back at the Devil’s Slide Trail in Idyllwild. He told us his journey was over because of the weather and conditions, but he was so proud that we were prepared and willing to push on. It was a real motivator as we headed up the steep climb to Cut Throat Pass. We left the trail head at 12:30pm, but because the trail had been so well cut by the teams ahead of us we made excellent time getting to the top. It was hard not to stop every few feet to take pictures of the stunning scenery that surrounded us! From this point we needed to wear snow shoes! It was both of our first time ever to snow shoe and after falling over on my first step, I soon got the hang of it and was addicted immediately! I honestly felt like we were on a snow shoeing vacation in the Himalayas. 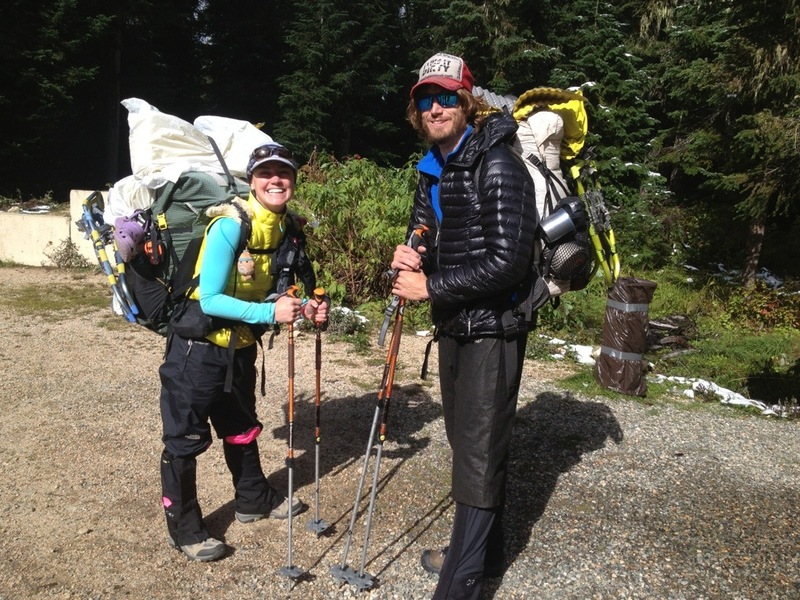 I couldn’t wipe the smile off my face the entire day and had to keep reminding myself I was still hiking the PCT. 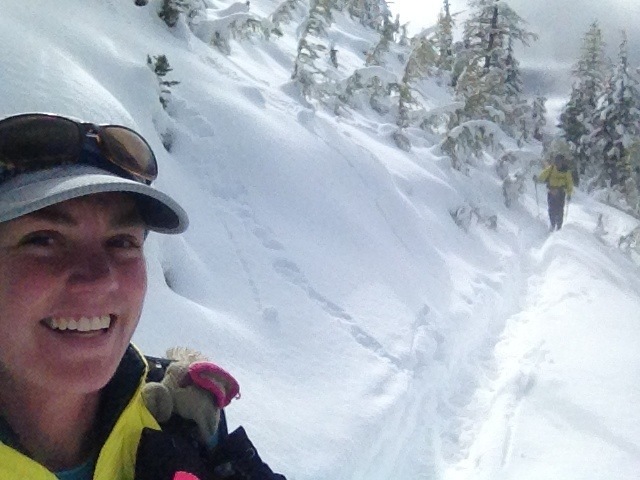 I never ever thought I’d be finishing the trail in snow, let alone snow shoeing for the first time. I also never thought I’d see the sun again on trail, and simply wished more hikers could see Washington in all its rugged beauty! We reached Methow Pass close to 4:30pm and decided we still had enough fuel in the tanks to head down to Golden Creek at a much lower elevation to camp. I was sad when the snow thinned out and the snow shoes had to come off, but I also realised what a beating my ankles had taken from the steep side-stepping down some switchbacks and the new higher boots which we had no chance at all to wear in. We reached Golden Creek just as it got dark, set up camp, and cooked dinner sitting outside with no rain for the first night in many. What a difference clear skies can make! Those pictures are amazing! 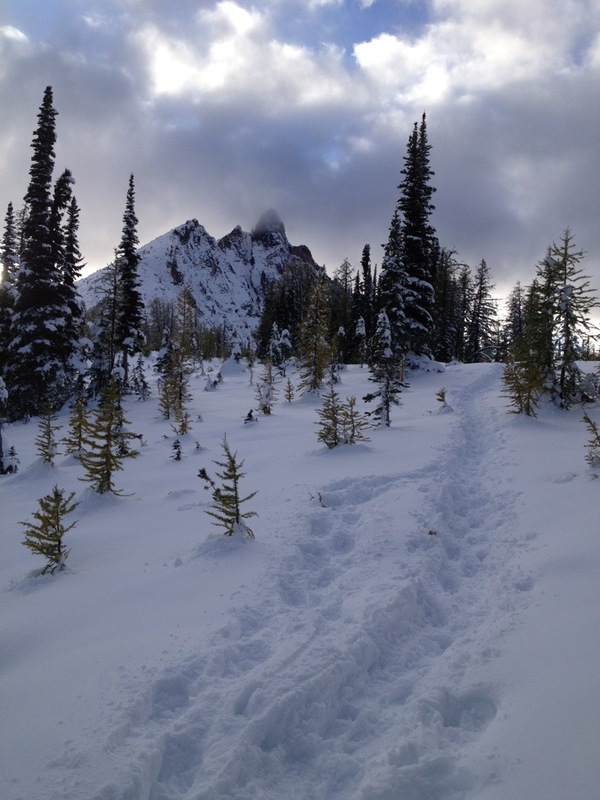 Washington is so beautiful normally….even more so in the snow! Thank you for sharing. It’s strange looking back over your yet-to-be experiences of the following days. Delighted to see the mood and joy you feel in the presence of such spectacular scenery. A wonderland is an inadequate description. Reminds me of the views above Whistler a little but this is more eye-popping and full of nature. What a day, Muk Muk !!! One day earlier I was sitting in an airplane on my flight home from Seattle to Germany and flew EXACTLY over the area where you hiked (crossed the US / Canadian border just 2 miles from the PCT monument according to my GPS) – and I could not see a thing for the whole time – one huge cloud covering more than half of the North American continent. I was thinking about you hiking down there in these conditions and am now all the more happy that just one day later you could enjoy such a truly glorious day on the trail in winter wonderland conditions. It has been a privilege to follow you on your journey via this absolutely wonderful blog of yours. I have enjoyed it tremendously. Thank you, thank you, thank you and congratulations on having the unbelievable mental and physical strenght to finish the trail in the kind of conditions you had to endure for most of the final two weeks. I had it a bit easier three years ago (suffering from injury instead of horrible weather) and the trail is still with me in my thoughts every day. So I imagine this will be even more true for you, too, in the future. It is something to look back to with gratitude and pride for a very long time. And now you know why I love snowshoeing, the difference being I get to pick what we call “Blue Bird Days” to go out and adventure and then go home to my warm house and bed. I honestly can’t imagine living outside in these conditions. So glad to see the snowshoe ‘freeway’ cut by those ahead of you! 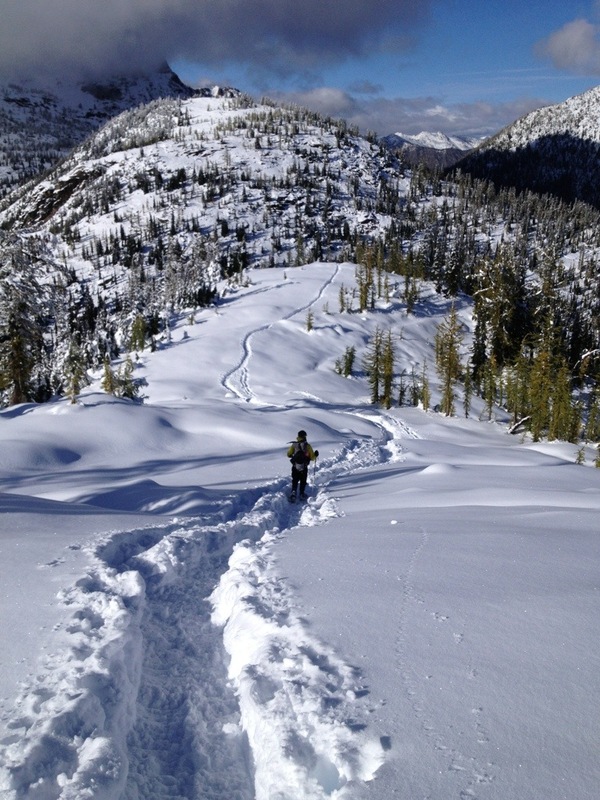 What a beautiful bluebird day to start your snowshoe additction. I was very happy to see you on some Atlas Elektra 1223 shoes. <– I've been an Atlas owner for 15+ years. I spotted them on your pack in the picture Ravensong posted at Devil's Backbone and let out a little sigh of relief for you. 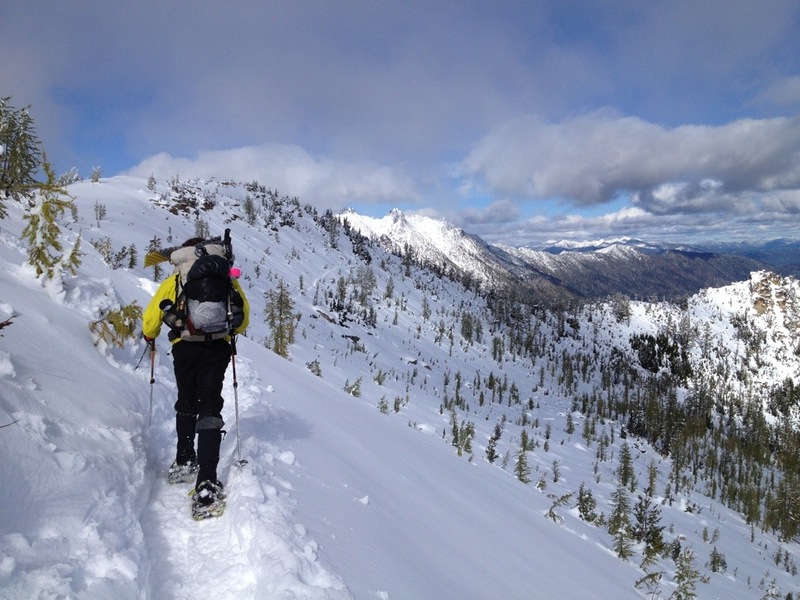 My Atlas snowshoes have carried me through some amazingly deep and technical conditions for years now. 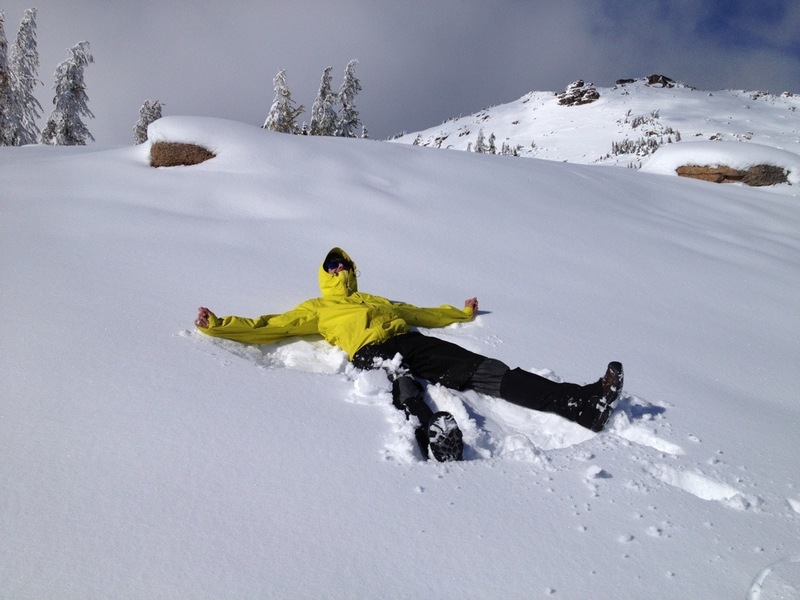 Now that you've invested in boots, gaiters, thermal layers and gloves … all you need now is your own pair of snowshoes! 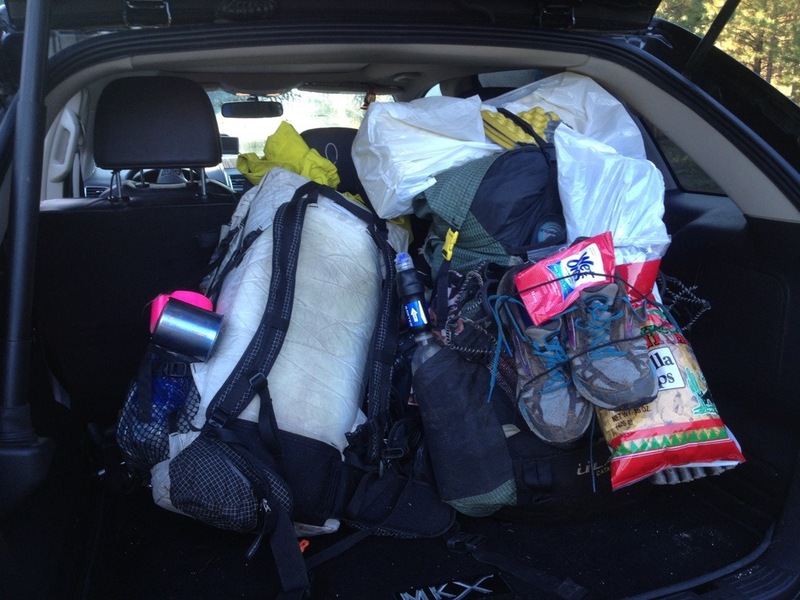 All those bags on the wall in our garage … Atlas snowshoes. For modesty sake, I won't share my winter nickname here. 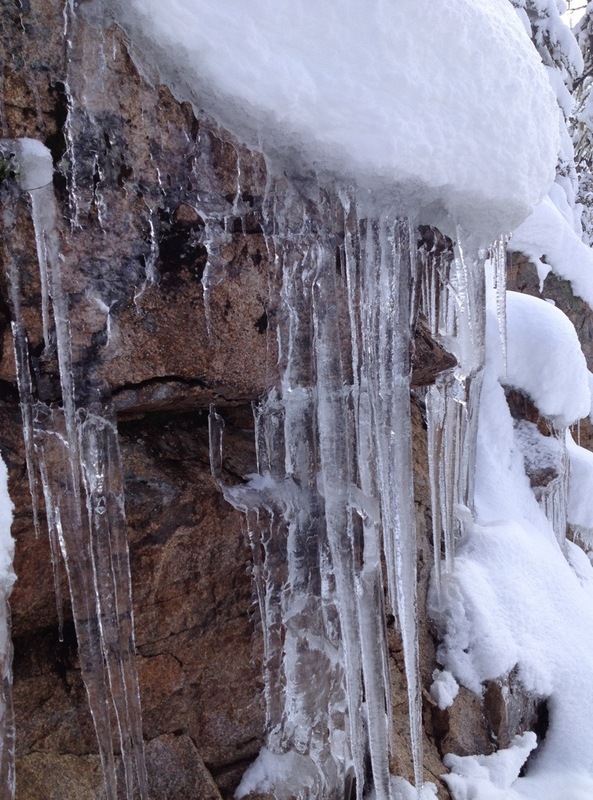 Oh my, what a beautiful winter day… and those pictures are amazing! So glad that there was also a really enjoyable day amidst all the struggles for you! And now I am looking forward to winter here in Germany – time to get the snowshoes out again! Incredible beauty. Thanks for the wonderful pictures. Your smile says it all. Spectacular photos and videos, Muk Muk. 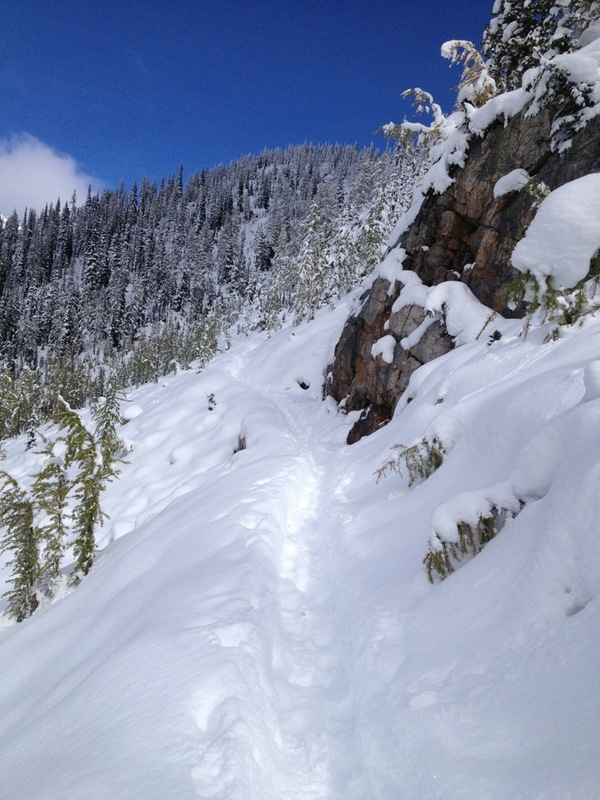 My favorite for sure is the last one…the one of you snowshoeing around that switch back. You don’t say a word, but you’re just grinning ear to ear, with a wee giggle, and that says it all. OMG! The scenery is beautiful. What a reward for all the hard work getting there. Amazing. 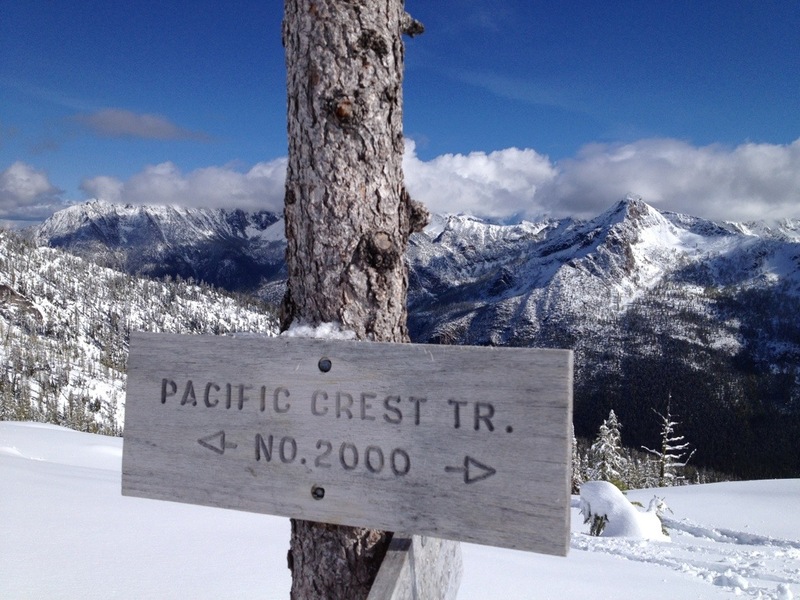 what a finish to the blogfest summer of 2013 on the PCT. You, Carrot, and Anish have all published incredible stories to the world of your adventures. Well, now you know. There really isn’t anything you can’t do. Keep going. Yay! 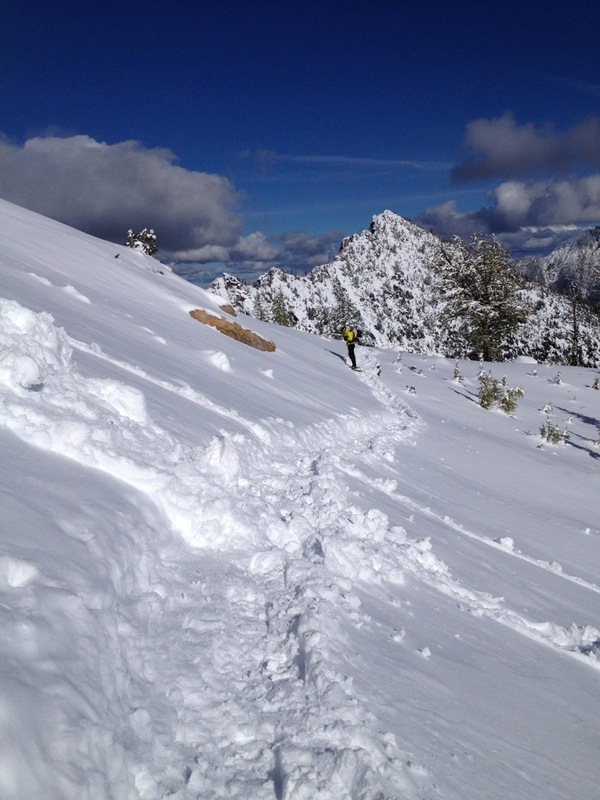 I am so glad you guys got to experience this section of the PCT in the sun. The views are outstanding. And I see you had some golden larches, which is a highlight this time of year…perfect place to be for them. 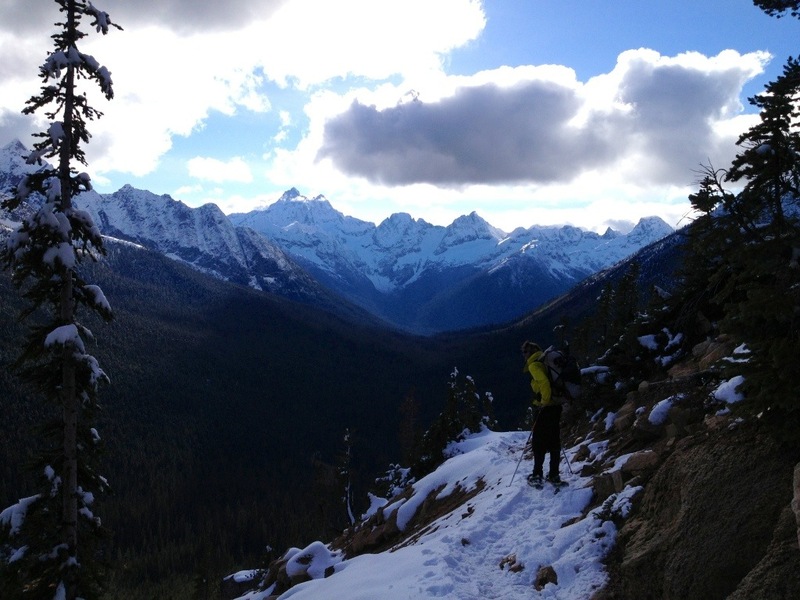 I was hiking along here last year around the same time…no snow then! Hi Muk Muk, What a incredible turn of weather for you to experience before finishing, this truly will be some of the most memorable, I’d have to think! You guys were so fortunate to have others ahead to break the trail, otherwise, navigation might be a real nightmare.